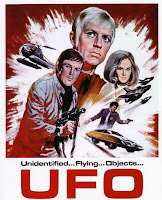 UFO is Gerry Anderson’s 26 episode science fiction series that originally aired from 1970 to 1971 in the United Kingdom and Canada followed by U.S. syndication in 1972 and 1973. Gerry and Sylvia Anderson worked together to create some of the most memorable children’s shows in the U.K., including Supercar (1961-1962), Fireball XL5 (1961-1962), Stingray (1964-1965), Thunderbirds (1965-1966), Captain Scarlet and the Mysterons (1967-1968), and Joe 90 (1968-1969). All the shows are science fiction-based and feature high-quality models as well as the Andersons’ own "Supermarionation" marionette puppetry, lauded at the time, but an antiquated technique compared to today’s digital technology. The complete series is available below from the Aeolus 13 Umbra 2 YouTube channel. UFO was a radical departure for the Andersons. Not only was it live-action, but the storylines were decidedly adult-oriented. Adultery, murder, betrayal, deception, and relationship problems were all on the table. The decision was also practical as well. Special effects are expensive and time consuming, particularly when models are involved. Dramatic, adult-oriented storylines balanced out the budget; however, they also had the effect of slowing down the action and alienating the Andersons’ young fan base. The action of the series takes place ten years in the then future of 1980. 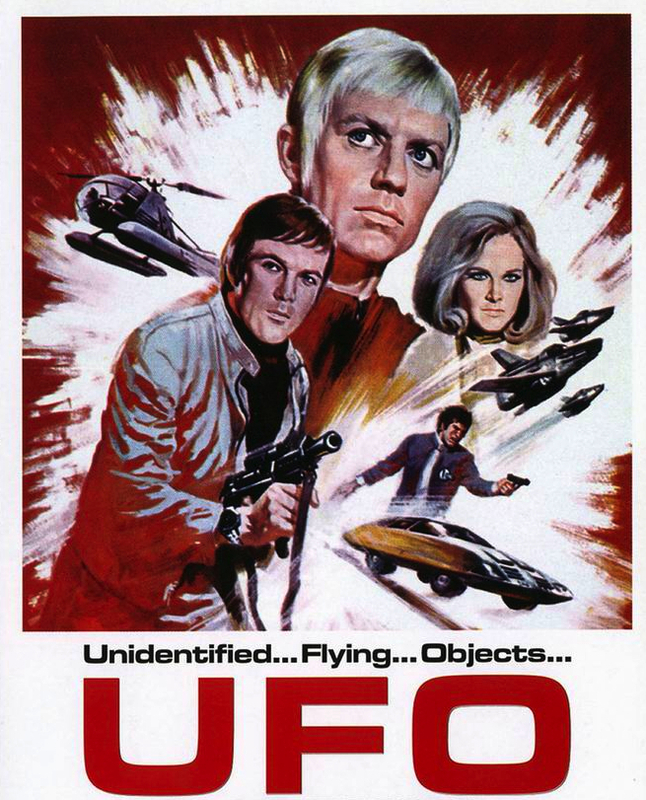 Commander Ed Straker (Ed Bishop, who also had a small part in 2001, A Space Odyssey), with his distinctive styled white hair, turtlenecks, and Nehru jackets, runs SHADO, an alien-fighting organization whose name is an acronym for Supreme Headquarters Alien Defence Organization. As the name alludes to, SHADO operates sub rosa, under the pretense of being a film studio, and in typical “Men in Black” fashion maintains its secrecy at all costs, even if it means risking innocent civilian lives. This is a theme repeated throughout the series and deaths are not infrequent occurrences. The limitations of the special effects of the times, as well as the cost involved, forced the Andersons to base many of the stories in terrestrial settings with wholly human problems. Paranoia, betrayal, and mistrust are common to many scripts. The endings are often dark with an ambiguous resolution. Permeating everything, however, is the mystery of the aliens themselves. No stories are told from their perspective. We learn very little about them, who they really are, what they call themselves, or their home planet. We know they are desperate and are mining organs from humans to sustain their dying race, but little beyond that is revealed. The aliens breathed an oxygenated green liquid and seldom communicated with humans. The opening theme by composer Barry Gray is a classic in a genre that can loosely be defined as “Action Jazz” — a tight ensemble with horns and keyboards producing a fast-paced intro grounded with a recurrent melody. The video montage establishes what the series is about and highlights the special effects shots. 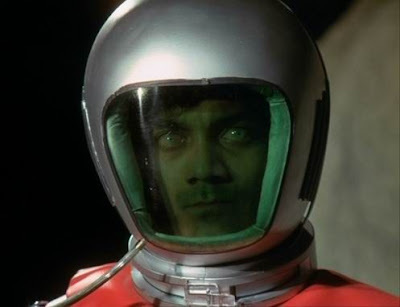 It’s typical of action shows of the era, such as Mission Impossible and Mannix and, in the successor series to UFO, Space: 1999, whose theme was also composed by Gray. The opening credits are woven into the early scenes of an episode after the theme, giving time for a slow reveal. The closing credits theme to UFO, also by Gray, is an underrated piece deserving of more attention. It is a departure from the other work Gray has done for Anderson. Rather than a fast-paced, action-oriented piece like the intro, it is an ambient sound bed, tinged with a bit of mystery, that slowly builds to a dramatic crescendo. It is more reminiscent of Brian Eno’s ambient work than a theme for sci-fi TV series, but it complements the often somber endings. UFO was also ahead of its time in terms of the social issues dealt with in the scripts. Divorce, drug use, and even interracial relationships turn up. In the episode Computer Affair, the frequently purple-wigged Lt. Gay Ellis (Gabrielle Drake) makes a command decision to save her lover, Lt. Mark Bradley (Harry Baird), at the cost of another man’s life. As Lt. Ellis faces the fallout from her decision, throughout the entire episode the fact she is white and Bradley is black is not even mentioned. In the future, interracial relationships are not an issue. Meanwhile, in the United States interracial marriage was still illegal in 17 states until 1967, just four years before the airing of this episode. For the time, the Andersons’ approach to this issue was ground-breaking. Based on initially positive U.S. ratings, the distributor, ITC Entertainment, approved development of a second series, but with the caveat that take place entirely on the Moon. This was a response to improving the pacing and ratings of the show by shifting the focus to the more popular elements of the series — the spacecraft models and special effects. Unfortunately, U.S. ratings dropped in the second half of season one, which led to ITC cancelling work on season two. 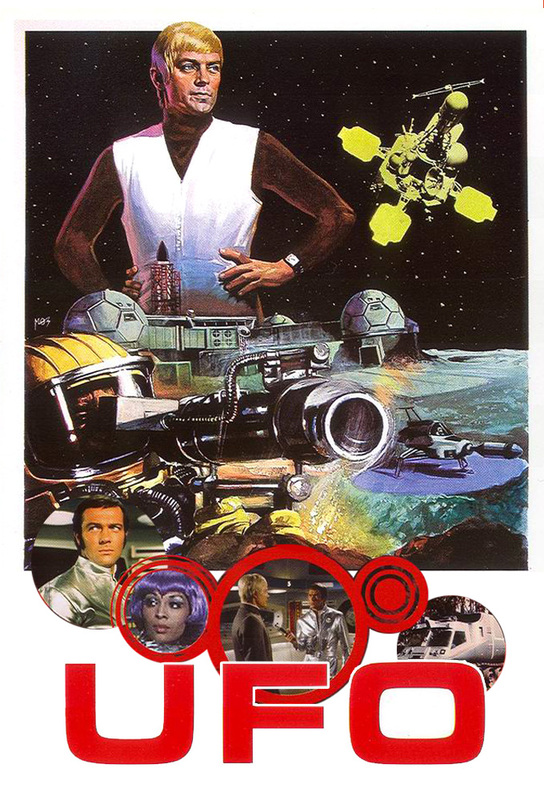 The Andersons salvaged their ideas developed for the now-abandoned season two of UFO for their new series Space: 1999 (1975-1977). Due to this connection, many fans regard both series as inhabiting the same "universe." The late 1990s and early 2000s saw several efforts to revive the series on TV, and a feature film was under development for a planned 2013 release; however, all these efforts fell through. The Andersons attention on the series’ overall production design and special effects left an enduring impression on sci-fi. The spacecraft model designs, influenced by 2001, A Space Odyssey, remain highly regarded nearly fifty years later. The adult story content was on a level beyond that of Star Trek and established that both the genre and the Andersons were capable of far more than expected. Nevertheless, the show, caught in the middle-ground between being an action-oriented children's show and an adult-oriented drama, never quite satisfied both. UFO’s weakness, however, lay in the dialog, which tends to be a bit too expository. While this is a problem endemic to sci-fi as a genre, it slowed down the pacing for a show’s young audience. ITC addressed these problem by requiring the aforementioned move to the Moon for the never-realized second season, which in turn led to the more successful, if equally troubled, Space: 1999. As Space: 1999 was being cancelled in 1977 Star Wars was just getting started, and the Andersons' previous sci-fi shows soon paled in comparison. Nevertheless, UFO and Space: 1999 set a standard in mature themes, realistic sci-fi modeling, season-long story arcs, and unified production design for future shows to emulate. Descriptions by G. Jack Urso. Click on links to view episodes. SHADO Moonbase — Ready for operations! SHADO’s first operation results in capturing an alien and discovering the secret of their existence — transplanted human organs. Civilian test pilot Paul Foster accidently witnesses a SHADO operation and is given a choice — either join SHADO with their groovy outfits and foxy ladies or die! Hmm . . . what to do . . . what to do . . .
A cat under control by the aliens puts a SHADO interceptor pilot under a hypnotic spell. After a Lunar Module is destroyed, Shado moves to destroy space junk in Earth orbit. Straker must decide whether to use Shado’s resources to investigate an alien defector or deliver life-saving medicine to his hospitalized son. A psychic comes under control by the aliens. Alien’s use mind control to take over Paul Foster and his lunar module co-pilot, Captain Frank Craig, and order them to assassinate Straker. A damaged Skydiver submarine stuck on the bottom of the ocean forces Straker to deal with his claustrophobia. A Royal Navy destroyer dumping highly toxic nerve gas into the sea comes under attack by a UFO that wants to release the gas into the atmosphere. While tracking down an alien, SHADO uncovers a murder plot. A man and a woman having an affair plan to kill the woman’s husband and make it look like an accident. Straker must decide whether to risk revealing SHADO’s existence, or allowing the lovers to carry out their plan. SHADO sends a satellite to take a close look at the alien home world — too close a look. A UFO reprograms the minds of three humans, giving them super strength and turning them into bombs. Paul Foster and an alien are stranded on the Moon and the two enemies must work together to survive. 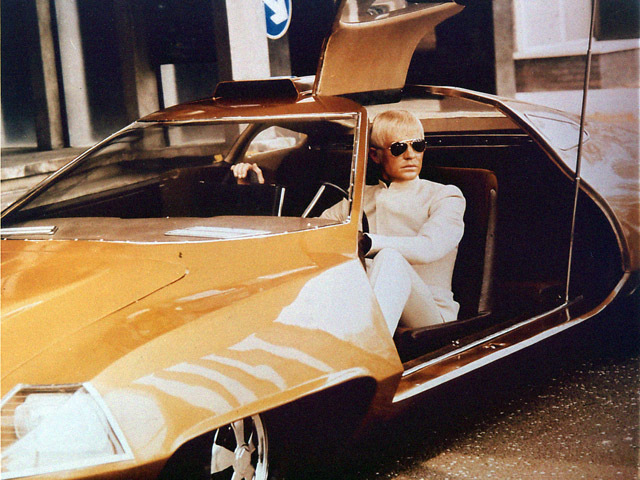 Straker’s car — Custom-built by Derek Meddings. An alien crystal causes hallucinations at SHADO HQ, and not even Straker is immune! In an attempt to strike at Moonbase unchallenged, the alien’s use a mind-controlled SHADO operative to feed false data to SID (the Space Intruder Detector). A SHADO pilot disappears while on a mission to repair SID, but later returns — under alien control! 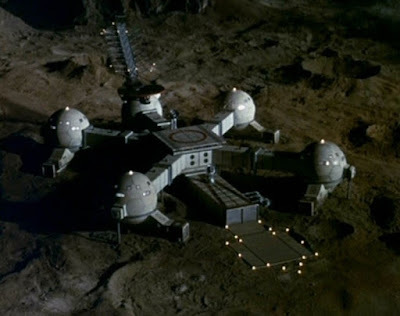 The source of communications blackouts at Moonbase are identified as coming from a corporate-owned mining base whose personnel discovered an alien jamming device. An alien operative uses a device to make time stand still for everyone but Straker and Colonel Lake. Paul Foster gets drunk at a party and is abducted by aliens. Foster endures an attempt to transform him into an alien, but is it real? Note: 3:43 to 4:35 muted to remove the Beatles "Get Back" from the soundtrack and avoid a copyright violation. When Col. Paul Foster is identified as the source of a security leak, he is tried and sentenced to death. During an alien attack on Moonbase, Lt. Gay Ellis breaks protocol to save a pilot she is in love with. To prove she is impartial, she must put his life at risk. Note: This is one of the first TV episodes to feature an interracial romance, which is further highlighted by the fact that the race of the two actors is not mentioned nor made a focus of in the story. In this flashback episode, which recalls events shortly after SHADO is set up, Straker is forced to keep secret the alien’s existence from his wife who suspects him of having an affair. An investigation into a missing equestrian leads SHADO to the alien who abducted him. SHADO discovers an underwater alien base and a plot to create doubles to infiltrate the organization. While Straker investigates a reporter who planted a listening device in his office, he leaves Col. Alec Freeman in charge, who gains a new appreciation for the decisions Starker makes on a daily basis. A woman in a coma for ten years suddenly wakes up and reveals that she and a boy she was with witnessed aliens planting a bomb. The boy is back, having not aged a day, and ready to set off the bomb.